Life is unpredictable. Just when I was expecting STI to go further south or at least stay below 3,000, it went north instead and went all the way above 3,100. This is why I never trust myself and never try to time the market (i.e. buy at the bottom and sell at the top). Suddenly, the sea of red become a mixture of green and red. I did not make any transactions this month as my GTD orders were all at a way lower price compared to the prices now. Hence, I decided to put my money in the 1 Feb 2019 Singapore Savings Bonds (SSB) on the last day of the application period since the interest rate is 1.98%. After all, if I need the money for investment or other purposes, I can redeem it easily. You can read more about SSB here. Among the financial results that were released this month, there is only 1 stock that impressed me. It is Mapletree Commercial Trust (MCT). The manager and property manager of MCT is so amazingly good at their job. Personally, I think that they are the best manager for any trust or reit. Look at the Mapletree family that is listed in SGX, their share prices always go north. MCT’s is currently trading above its NAV of $1.48. The dividends amount keep increasing with their frequent asset asset enhancement initiative (“AEI”) and active tenant remixing exercise. Also, they managed to get a bonus GFA of 24,000 sq ft of retail space at Basement 1 in Vivo City by converting some of the space at level 3 into a National Library. It is important to note that MCT has other properties too. 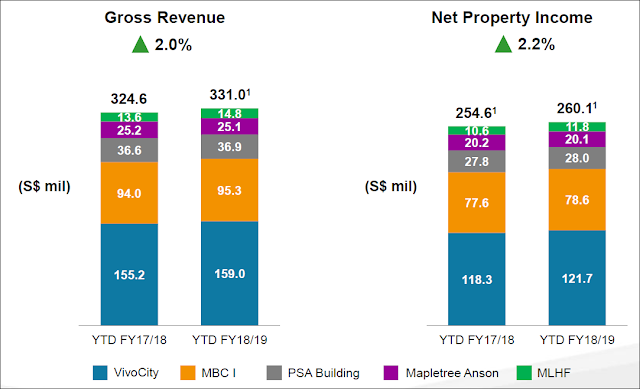 But Vivo City provides the most revenue and Net Property Income. Also, Kyith from Investment Moats has shared a good point, PSA may move out of MCT’s PSA building in two years’ time when its own building is completed. Should that happen, their shipping partners located in the same building may also eventually move out. Nice blog. Thanks for sharing your portfolio details. Looks to be really good and useful.